Knowledge@Wharton: This book could easily be titled The Amazon Revolution. What is it that Amazon knows about consumers that other retailers don’t? On the second row, it’s take away pain. And on one, it’s the pain of the product’s price. Walmart is an example of take away pain and offer low price. Walmart, Costco, TJ Maxx would be in that quadrant. Take away the pain from the customer experience is what Amazon did really differently, and they made it convenient. They made it frictionless. In Amazon’s case, their differential advantage is collecting a lot of customer data so that they can constantly simplify and personalize and customize the experience to make it easier and easier for the customer. That’s the matrix. That’s how I can define things. But the strategic implications of the matrix are something else. Kahn: Yeah. That’s something that I discovered when I was trying to map these different strategies on the matrix. In a lot of marketing strategy frameworks, it’s, “Be the best at something and good enough at everything else.” That’s a rubric that we’ve used strategically. But when I was looking at what was happening in retail, it’s an industry that is being disrupted. It’s very, very hyper-competitive now. If you can’t make it, you’re really going to go out of business. Kahn: I do think understanding the importance of customer experience is really important — understand that customers now have been catered to. They expect things to be convenient. They expect the retailer to have an online presence. There are some retailers who still don’t have an online presence, and I wonder what will happen to them. Trader Joe’s is a retailer that people just love. It’s a real niche retailer, but they don’t have much of an online presence. I wonder what will happen going forward if they don’t rectify that situation. Knowledge@Wharton: This new era of retail also has implications for commercial real estate. How will developers have to change their strategy to accommodate this new world? Learn how to unlock significant opportunities for adding value and growth by innovating with your existing products, customers and markets. Implement a process for business model innovation that can be used repeatedly throughout your organization. Learn more. Dear Barbara Kahn, I like the Kahn Retailing Success Matrix, proposed by you. 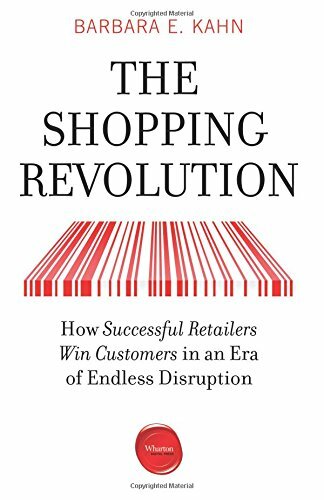 I also believe that your book ‘The Shopping Revolution’ should be a good read. The analyses discussed in this article about different brands, or the retailers, and e-commerce giants, too is logical. And everyone knows how the retail market is being heavily influenced by e-commerce, putting even some big actors out of business. However, I have a simple point. Can all the e-Commerce giants, the big Shopping Malls, and the other big outlets ever break the unique service appeal of the friendly small corner shop in many residential areas at a walking distance, where one makes a dash to buy essentials, food items, drinks or other sundries? Because there is a personal touch here with the shop-owner also giving his welcome advice for free, if you are a regular about the freshness of items or any new introductions, which appeals to the customer since there is a rapport and faith developed between the two sides of the counter. And let us not denigrate the scale of things thinking the small corner shop is a flash in the pan, because there are thousands of them particularly in small towns and villages, across the world. After all, one does not go to a big shopping mall just to buy those four quick eggs and a bread loaf? As against this, the e-commerce delivery guy just hands you a packet of the items you ordered. Will a Frenchman or a Swiss buy cheese or croissant like that, without looking at the merchandise or even tasting it, which the small corner shop owner is too glad to offer? In countries like India, these small shops sell at competitive prices and even accept orders on phone and home-deliver anything, from medicines to milk to veggies, and so on. A small newspaper shop anywhere in the world lets you read quick news or have a peek at the new magazines or books even if you don’t buy them. And if you are a customer in Kathmandu, you can even sit on a bench outside his the small shop and chat with the owners and other passing customers whom you know. Can e-commerce provide all this? Then there are savory dishes, I can name several, which are made right there before your eyes by only a specialist, may it be in Istanbul, or Kolkata, Cairo, Okazaki or Taipei. All the McDonalds and KFCs etc. put together cannot beat them in their expertise. And several friendly corner shops don’t even insist on payment on the spot from regular customers to keep the clientele. They keep the record of items purchased and one pays at the end of the month. Any competition?? I think the point is the customer has changed over time due to improvements in one area or another. The corner shop has its advantages however over the next 25 years that could also evolve into something better. I liked the amazon buy button for Barbara Kahn’s book right at the end of the article!